I was enjoying the last drops of a hot, strong, post-prandial Greek coffee on the terrace of a café in Little Venice, Alefkantra, when a large pink bird waddled past. He paused, preened, then hopped gracefully up the café steps. All heads turned as he passed, cameras clicked and flashed, a waiter with an armful of carefully balanced plates stood back and the Maitre d’ rushed out to usher him through the door. “Who was this famous fowl?” I wondered. 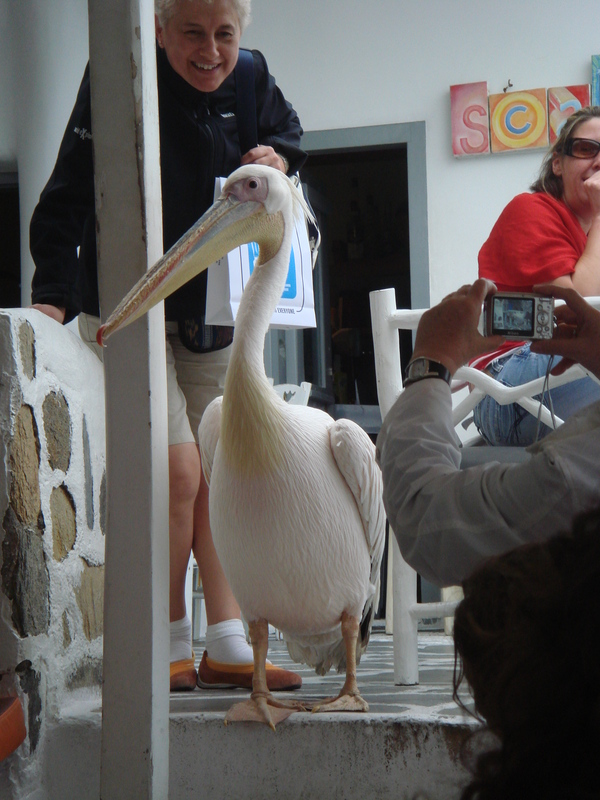 This was Petros, the pink pelican, the Mascot of Mykonos. With his girlfriend Irini, (also a pelican, also pink) he wanders the steep stone laneways, dropping in for a snack at cafés and restaurants along the way, posing for pictures, visiting friends, blending with the tourists and enjoying every moment of his life as the island’s most celebrated bird. In 1954, after a fierce storm, a local fisherman found a pelican washed up on the beach. He was exhausted, bedraggled and unable to fly. The fisherman nursed him back to health and before long he was a familiar figure, waddling the laneways, dropping into cafes or preening in the squares for a photo opportunity. The people of Mykonos named him Petros. Everyone, islanders and tourists alike, fell in love with him. Petros seemed set to live happily ever after on Mykonos, and although nature designed pelicans to live in pairs, he seemed content with his bachelor life. However, a well-meaning match-maker and rather famous Mykonos visitor, called Jackie Onassis, decided that he should have a wife. She found him a partner in Louisiana. Her name was Irini. The wedding of Petros and Irini was a big fat Greek affair, with crowns, canopies, several priests, the whole population of Mykonos and a multitude of tourists in attendance. The marriage, however, was not a match made in heaven. Petros didn’t warm to Irini and she gave him the cold shoulder. They went their separate ways. When Petros met with a tragic accident in 1985, Mykonos went into mourning. Then, in May 1986, a generous German travel operator by the name of Rudolph Kaestele sent the people of Myknonos another pelican. They called him Petros II. He arrived at the airport with a tiny German/ Greek dictionary hanging from a chain around his neck. He was ferried by Mayoral limousine into Manto Square, where he was met with music, dancing, baskets of fresh fish and flowers. Then came the moment that everyone had been waiting for, Irini minced into the square. Would Petros II warm to Irini? Would she give him the cold shoulder? As soon as he saw her Petros II opened his beak and gave a long cry of approval. Irini was unable to resist. They waddled off into the Little Venice sunset in Alefkandra. And the rest, as they say, is history.